In Norse meethology, Loki (/ˈloʊki/), Loptr, or Hveðrungr is a god or jötunn (or both). Loki is the son o Fárbauti an Laufey, an the brither o Helblindi an Býleistr. Bi the jötunn Angrboða, Loki is the faither o Hel, the wouf Fenrir, an the warld serpent Jörmungandr. Bi his wife Sigyn, Loki is the faither o Narfi an/or Nari. Bi the stallion Svaðilfari, Loki is the mither—givin birth in the form o a mare—tae the aicht-legged horse Sleipnir. 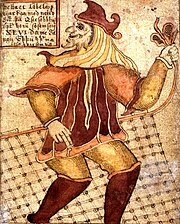 In addeetion, Loki is referred tae as the faither o Váli in the Prose Edda. This page wis last eeditit on 22 Mey 2015, at 03:02.